Grasmoor is the dominant fell in the Crummock Water scene, looming over the road that runs alongside the lake heading towards Buttermere. From this angle the crags of Grasmoor End are especially impressive, while the lower slopes are a popular picnic site, with several small car parks. From other angles the fell is less visible, as it is bordered by lower but still impressive fells. The view of Grasmoor from Whiteside is good, with Dove Crags seen to impressive effect, and it also impresses from the fells west of Crummock Water and Buttermere. The fell is almost hidden from the west, with Crag Hill and Hopegill Head blocking most views from the Keswick area. Grasmoor is the highest point in an impressive collection of fells grouped between the Newlands Valley and Crummock Water, but it can't be said to be at the centre of this grouping. In fact this is an unusual area in that the centre of the upland area is the pass at Coledale Hause. This splits it into two parallel ranges, with Whiteside, Hopegill Head and Grisedale Pike in the north and Grasmoor, Whiteless Pike, Crag Hill and Causey Pike in the south. Grasmoor is the highest and bulkiest of these fells, but only really forms the western edge of the southern ridge. It also fails Wainwright's watershed test, with all of the streams that rise on or border the fell flowing into the River Cocker. There are three main routes onto the summit plateau, one from the south and two from the east. In the south the ridge of Lad Hows provides a dramatic but fairly easy way onto the plateau, although the last climb is quite steep. This brings you to a point just to the west of the middle of the summit plateau, so turn left at the top of the climb to reach the top. The eastern part of the summit slopes gently down to a valley between Grasmoor and Crag Hill. This valley can be reached from north or south. From the north one approaches via Coledale Hause, which can be reached from Gasgale Gill, Coledale or down the ridge from Hopegill Head and Sand Hill. From the south this area is approached along Whiteless Edge, a fine ridge that connects to Whiteless Pike and then down to Buttermere. The Whiteless Edge and Lad Hows routes are shortest, the Gasgale Gill route is dramatic (although the lower reaches of the footpath sometimes get swept away after storms). We have an ascent of Grasmoor via Lad Hows returning via Coledale Hause and Gasgale Gill. The summit of Grasmoor is a large grassy plateau that stays above 800m for over two-thirds of a mile from east to west. As is often the case with such large summits this does mean that you have to leave the summit to get the best valley views, especially for the views to the east. The plateau is in the form of a figure of eight on its side, with the highest point on the western half. The neck in the middle is formed by Dove Crags in the north and the top of Rannerdale in the south. If time allows head west to see the impressive view from the top of Grasmoor End and north to look down Dove Crags. 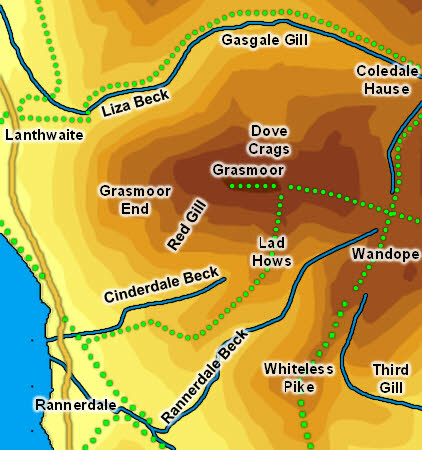 The boundaries of Grasmoor are formed by three streams. In the north is Liza Beck which rises south of Coledale Hause, flows down to the pass then turns west to run down the splendid Gasgale Gill. It then turns north and runs into the River Cocker just north of Cornhow, although by this point Grasmoor has been left behind. In the south is Rannerdale Beck, which forms in Wandope Moss and runs south-west between Lad Hows and Whiteless Edge before turning west to run into the lake. In the west is a nameless and rather minor stream that runs south from Lanthwaite Gate into Crummock Water, and forms the boundary between Grasmoor and Brackenthwaite Hows. Grasmoor has no tarns, although the area below Dove Crags does feel like it should contain a small tarn and there is even a big enough dip here to be recorded by OS contours. Presumably the rock below this ledge is too fragmented to support a tarn and the water that must reach this area drains away instead. The western border of the fell is formed by Crummock Water. The lower slopes of Grasmoor have two lost settlements that can easily be visited (technically the southern one belongs to Rannerdale Knotts, but Grasmoor looms overhead). In the south is an abandoned farmstead now famous for the Rannerdale Bluebells. This can be reached from the small car park at the western foot of Rannerdale Knotts. In the north is an abandoned homestead, with hut platforms inside a sunken area. THis can be found from the car park at Lanthwaite Green by heading north-east along a fairly clear track then turning right before this track reaches the edge of the common.